Craig Dobbin’s CHC Helicopters swoops in to buy any rival or fly any mission, including sorties into war-torn Rwanda and the turbulent waters of the North Sea. In the spring, Chicoutimi, Que.-native Barrette, 38, found himself in the Rwandan capital of Kigali as the senior pilot on a civilian peacekeeping contract to transport troops and fly reconnaisance and medical-evacuation missions. The outbreak of civil war on April 6 sparked a massacre of hundreds of thousands of Rwandans and trapped foreigners in the crossfire, including Barrette, who, with another CHC pilot, holed up in a hotel controlled by rebel forces for four days. After finally gaining permission to join a convoy of foreigners to the airport, where they were to line up for evacuation flights, the pilots instead “decided our best plan of getting out alive was to take our helicopters without telling anyone,” Barrette recalls. “We hid in a container at the airport for 20 hours, then took off in our helicopters for Tanzania, where we fuelled up before (eventually) flying to Somalia” – yet another UN-monitored trouble spot. 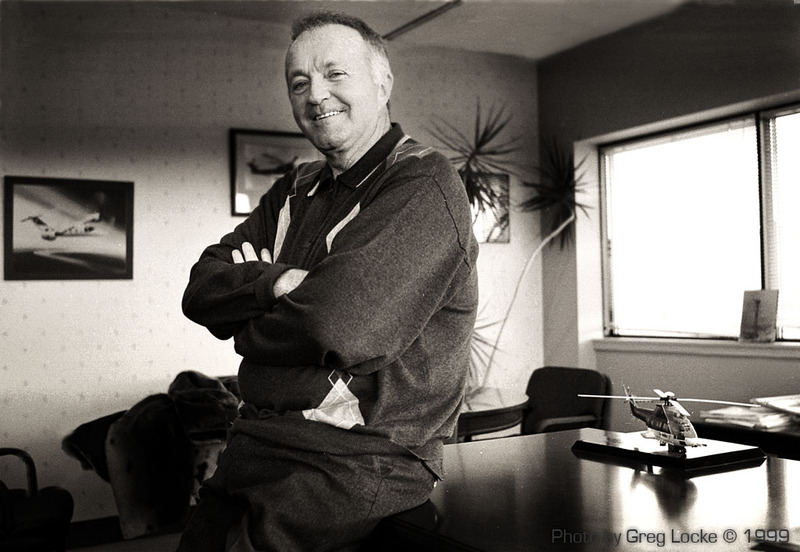 Helicopter magnate Craig Dobbin in his St. John’s office. Photo by Greg Locke © 1999 …click to enlarge. Throughout the Rwanda ordeal, members of the Dobbin family, CHC’s majority owners, could only pray from a great distance for a safe outcome. Four times an hour, hands-on founder and CEO Craig Dobbin phoned CHC headquarters in St. John’s from his Florida winter home for updates; and when the pilots were safe in Somalia, he sent a jubilant letter of congratulations to Barrette. From his base in Aberdeen, Scotland, Dobbin’s son and executive vice-president, Mark Dobbin, CHC’s heir apparent, was equally concerned but more composed, monitoring the news on TV but trying to remain focused on his own tasks, while leaving aspects of the Rwanda crisis to specialists. The contrasting reactions of the two men were typical of their very different approach to everyday upsets, major and minor. The senior Dobbin, 58, a self-educated Newfoundland entrepreneur who turned his whim to own a recreational flying machine into the world’s biggest helicopter company, with 1994 revenues of some $300 million, finds turbulence exhilarating. Son Mark, 34, is a steadier soul, a cool MBA grad who shuns a flying-ace outlook in favour of executive teamwork. “I’m more prone to risk, and very expansionist,” says Dobbin Sr., who continues to push CHC to satisfy his insatiable appetite for new acquisitions and joint ventures, inviting a Bay Street follower of CHC stock to observe that “he comes out of the sky like Stormin’ Norman (Schwarzkopf).” Mark, by contrast, is a more pragmatic and control-oriented spirit than the man who built the company that Mark will someday run. Raw entrepreneurship and buttoned-down cost control. The blend of raw entrepreneurship and buttoned-down cost control has mostly paid off in steady, albeit sometimes meagre, profits since CHC’s incorporation in 1987. With bemused admiration, Craig Dobbin’s son and other senior managers try to consolidate CHC acquisitions while Dobbin Sr. relentlessly pursues grandiose visions. But lately Craig Dobbin has been struggling with a serious lung ailment that he has successfully fought by altering his diet, if not his hectic corporate lifestyle. Even as his retirement draws nearer, Dobbin Sr. can’t resist hatching strategies for building a huge new sideline in aviation repair and gobbling up big stakes in two of his largest U.S. chopper rivals, even as CHC digests its recent $50-million acquisition of British helicopter operator Brintel Holdings Ltd. (which operates as British International Helicopters Ltd.). The question for CHC’s minority shareholders is whether, without its expansion-minded founder at the controls, CHC will indeed abandon his daring flight plan in favour of consolidation, or embark on still more bold, debt-financed forays. The company that Mark Dobbin will one day control already requires a seasoned team of executives to manage its sprawling operations. Wherever there’s money to be made in helicopter services, at construction, mining, recreation and emergency hospital sites in urban centres, the Arctic, in jungles and in war zones, some of CHC’s more than 260 choppers and its 1,500 mostly Canadian employees are found. At any time, CHC machines also are deployed in peacekeeping contracts in up to 11 countries. The range of choppers owned and leased by CHC couldn’t be wider — from economical single-engine whirlybirds that carry four people and look like metallic bumblebees, to throbbing 20-passenger multiengine Aerospatiale Super Pumas used in supplying offshore drilling rigs. Dobbin’s holistic strategy extends to repair and overhaul, one of CHC’s fastest-growing divisions, which is expected to contribute as much as $90 million in revenues, or about 25% of the total, in the firm’s current fiscal year. Its employees are all non-union, and some of its pilots are trained at its own pilot schools in Central Canada. But Dobbin’s most prominent strategy, the one that attracts the attention of wary rivals, is CHC’s aggressive pursuit of new markets in its core helicopter transport business. To that end, in February, CHC finished gobbling up British International Helicopters, formerly part of the failed Maxwell business empire, a deal that added 25 large choppers and $100 million in annual revenue and provided CHC with a window into Europe. Another gambit in cracking new markets is CHC’s mastery in snagging short-term joint ventures, from Mexico to Russia, which it uses to negotiate entry to restricted markets. Mark, Dobbin, CHC Helicopters. Photo by Greg Locke © 2000. …click to enlarge. Mark Dobbin, who has never doubted he will eventually take over CHC, became infatuated with choppers as a teenager when his dad took him for his first ride. “I fell in love with helicopters right away,” he says, “and knew that helicopters would be my career.” The younger Dobbin is circumspect, however, about exactly how he will manage the family firm. After all, his father remains very much in control, and at least in the short term, the likelihood is that members of CHC’s management team more experienced than Mark would take over-notably president Patrick Callaghan. Mark does allow that without Craig Dobbin at the controls, “there would be a period of slower growth, with the focus on managing the existing core.” Appearances to the contrary, that transition is already under way. “Dad has been the entrepreneurial spark,” says Mark, “but the company is now run day to day by professional managers.” Dobbin Sr. happily assigns a strictly visionary role to himself. “My job is to find people to do jobs for me, and those people put form and substance to my dreams.” Dobbin’s hired hands have a practiced response to his habit of calling senior officers with ideas at all hours of the day and night. “We try to temper some of Craig’s enthusiasm and bring him around to being more practical,” says chief financial officer Edward Murphy with a chuckle. It seems there’s no stopping the elder Dobbin’s vision of endless global conquest, though. At Craig Dobbin’s direction, CHC has set the wheels in motion to buy stakes in two of CHC’s biggest U.S. rivals, Petroleum Helicopters International of Lafayette, La., and troubled Rocky Mountain Helicopters of Provo, Utah. The CHC founder also nurtures ambitions to set up a repair and overhaul plant in Europe in partnership with U.S. helicopter maker Sikorsky Helicopters. Skittish investors have not always warmed to Craig Dobbin’s bravado. In 1992, when CHC’s share price was stuck in a downdraft, one broker complained about the CEO’s unpredictability. But when the stock bounced back to $12 early this year from a low of about $2.50 in 1988, the broker was singing a different tune. “CHC and Craig are maturing,” he said. Yet Dobbin’s style hasn’t changed at all. The third of 11 children in a tight-knit family that owned a struggling lumberyard, Dobbin started his first business at age 8, selling 25-cent chances to hit a nail into wood in one stroke at fairs in St. John’s. After leaving school at age 14, the standard at the time, he eventually made his fortune in a wide range of businesses, from underwater salvage to airlines to land development in Canada and the United States. Today, about 3,000 employees, almost all non-union, work for companies controlled by Dobbin, including the troubled regional carrier Air Atlantic Ltd. (which filed for protection from creditors earlier this year), a Newfoundland fish farm, and property company Omega Investments Ltd. Dobbin has three sons and two daughters. Only Mark and another son, who is with Air Atlantic, work in family businesses. Although Dobbin has had his share of failures, he has a reputation of living up to his commitments, taking generous and often personal care of his employees (a low-level airport labourer was recently entertained at Dobbin’s personal mansiob) and for getting his companies and himself out of periodic jams by maverick means. His close friends and fishing buddies include top provincial and federal politicians. In response to criticisms of his political associations, Dobbin retorts that he actually avoided bidding for, or lost, provincial contracts because of his friendships. Mark Dobbin moved this spring with CHC president Callaghan to Aberdeen, where the two men manage the newly acquired Brintel, seek British government helicopter and repair and overhaul work, and scour Europe for new contracts. Mark Dobbin says his education has primed him for this work: After finishing a commerce degree at Memorial University in St. John’s, he took an MBA at Dalhousie University in Halifax, specializing in international business. In between the two degrees, he apprenticed for a year at Petroleum Helicopters International, where he worked in almost every department. 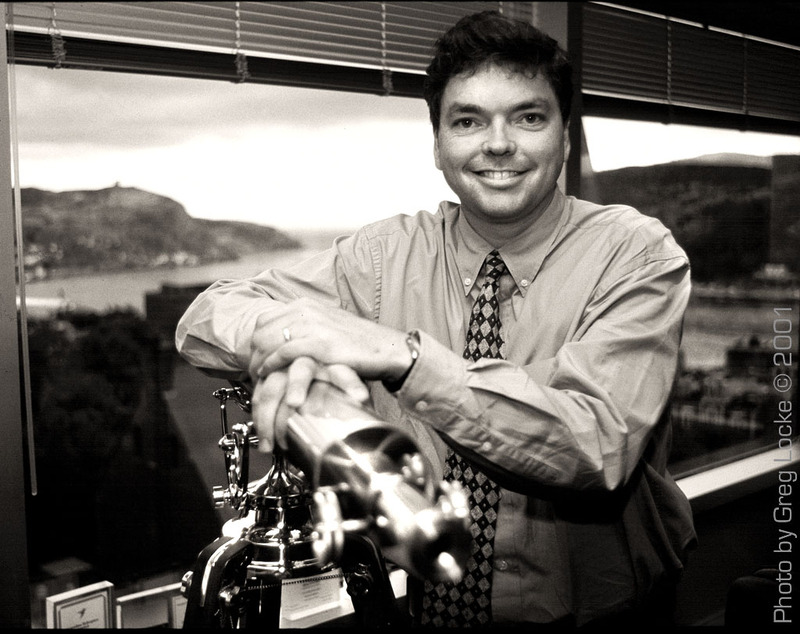 After completing his MBA studies at Dalhousie, Mark worked for 10 months in France at the helicopter manufacturer Aerospatiale SA, before joining CHC predecessor company Sealand Helicopters Ltd.
Mark’s task is to keep an iron grip on CHC’s worldwide leadership position, while at the same time trying to wring profits from the acquisition binge his father has wrought. Which accounts, perhaps, for the many occasions when the very different lifestyles of father and son are evident. Early this year, for instance, Dobbin Sr. played host to a gala gathering in the CHC head-office hangar to celebrate the Brintel acquisition coup. The mayor of St. John’s, the Newfoundland lieutenant- governor and top business officials revelled to Irish fiddle music and supped on Irish stew while Dobbin Sr. presided, his dignity unsullied by the bright green plastic baseball cap on his head. As his father was being congratulated, Mark Dobbin was far away in Aberdeen, quietly studying spreadsheets and shaping his plans to honour his father’s go-for-broke growth legacy, without flying too close to the sun. Epilogue: Craig Dobbin passed away in October, 2006, exactly one day after he stepped down as executive chairman of CHC. His son Mark Dobbin took over as chair until CHC was sold, in 2008. In 2013, CHC claims to be the largest helicopter company in the world.